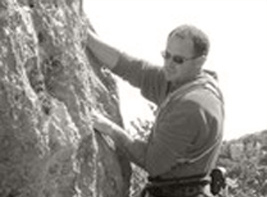 Started most of his rope work with the Sliema Venture Scouts in the early 80's, he has now at age 44 been climbing for more then 25 years. Richie originally completed his first lead climb in DMS army boots and gaiters. He has come a long way and now leads climbs up to E2 5c (6c). He has obtained a UK Single Pitch Award qualification and has done years of local guiding but mostly enjoys putting up new routes onsite at HVS 5a/E1 5b. Richie has been involved in the climbing guidebook since the local crew took over this project. Together with Andy he meticulously combed the list of crags locating and describing each of the climbs. His organizational skills in route checking and pleasant bar-side manner ensured that the ball was kept roll most enjoyably. 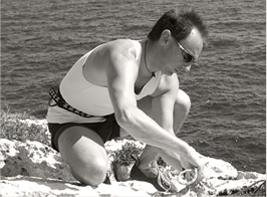 A British national who's been climbing since 1973 has set up new climbs in the UK, Ireland and Bulgaria, and was active in putting up some of the hardest, most gutsy routes in Malta during the 80s and 90s. climbing up to E6 (7c/WI6) his portfolio of accomplishments includes; Salathe in Yosemite, Bonaiti on the Dru (before it fell down) and the Walker Spur (on which he suffered a compund fracture of the femur from a rockfall one pitch from the top; taking nearly a day to winch him up to the helicopter rescue). Having written a guide to High Tor in the English Peak District, John completed a lot of the guidebook before recurrent 3-hour flights took their toll and the mission was handed over to local climbers Andy and Richie for completion. 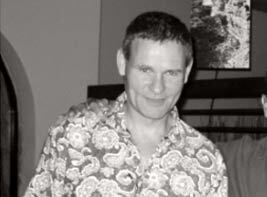 He has since written numerous articles for UK climbing magazines. Climbing since 1985. Andy signed on as the first member of the University Rock Climbing Club. He's climbed consistently since then, enjoying chossy, vegetated epic new climbs on sea cliffs. 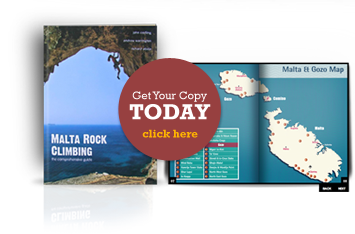 He delights in weaning newcomers to the thrills of climbing, and has been responsible for recruiting some of Malta's best climbers. Andy has logged climbs in locations like France, Italy, Kalymnos, Switzerland and Germany. In 2002 he reached a personal record height of 6,427m, on summiting Ancohuma in the Cordillera Real, Bolivia. Since being handed the project Andy championed the progress of the guidebook, a role which had him checking climbs, dangling unsuspecting photographers off ropes to get "the right angle", and coordinate all the other less adventurous aspects of bringing it to print.